Mr Francis Kitaka, the Chief Executive Officer MTK Uganda Limited said Uganda has job opportunities enough for them and that they should not go abroad to seek employment. Mr Kitaka made the remarks at the third graduation ceremony of University of Kisubi themed “Enhancing Industrial Development” where he was the guest of honour in Entebbe on Friday. Mr Kitaka said government should tell banks to decrease their interest rates and encourage people to come up with innovative ideas which can turn into employment opportunities. “Innovation begins from childhood so parents need to teach children how to be innovative and those in power should give us a conducive working environment. This country has so many money making opportunities,” he said. The University Chancellor Bro. Peter Kazekulya said the university which was founded in 2004 as tertiary institute is set to begin teaching Masters and Doctor of Philosophy (PhD) courses. “The success of this university since its inception in 2014 has been a result of hard work and teamwork as the entire university community and today we have seen 196 students graduate with 92 of them women and 104 men,” he said. 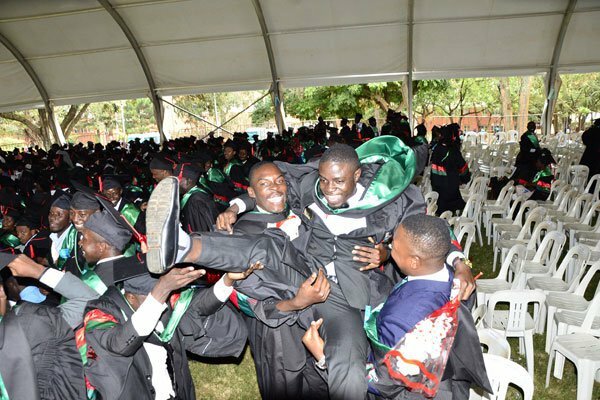 The vice-chancellor Prof John Ssebuwufu said the graduates should back up their degree with professional qualifications to attain an employable skill to compete in the job sector. “As you join the world of work, one thing that should be uppermost in your mind is to build a career based on real professionalism, creativity and Innovation which are key to a successful career,” he said. Mr Ssebuwufu said the graduates ability to create and innovate will come in handy when they feel their best efforts at work is not good enough.